This is part two, the true story of raising hens in a suburban rental palace. When last we visited our feathered fowl there was mutiny and blood, feathers were flying and the farmer (that's me) was losing too much sleep. A story can be told many ways, and I am electing to take this tragedy and shine a humorous light on it. Nobody wants to read about me crying over my pitiful farming circumstances. If you do laugh, do so with a tender heart, with sympathy. We are not wholly unfeeling. Maria and I took the brothers to school and then we came home and procrastinated. She thought we were just watching Oswald and Weenie navigate their whimsical world, but really I was coming to terms with my predicament: 2 bad hens, 1 henpecked chica, a very small yard and suspicious neighbors. What to do. What to do. I am not ready to take my farming experience to the "next level" and the Bantam Sisters, Fantam and Frida, were not taking my empty KFC threats seriously. I knew what had to be done, but I did not get up and do it until the threat of seeing "Lazy Town" got me on my feet and down to business. As I look back on those early days when we brought Buttercup (later renamed, Peanutbuttercup, then Frida) and Fantam the Bantam home, I recall that they were never easy girls. In fact their distinct personalities and appearances were noted from the onset. We loved them. We welcomed them in to the fold. We met their needs, nurturing their talents, instilling them with our unconditional admiration. We talked about college and keeping respectful Face Book pages... oh wait we're talking about the chickens. Never mind. Scratch that last part. They ate organic. Do you remember English class and suspension of disbelief? "It might be used to refer to the willingness of the audience to overlook the limitations of a medium, so that these do not interfere with the acceptance of those premises." We made the long drive to our favorite feed store. They know me well there, and they still like me. At the back of the shop, in their yard, they keep their own chickens, fresh hatched and hens and roosters and molters... nothing more humiliated than a molting chicken, except maybe a wet cat. We brought Pip here when we finally accepted that he was not a she. I miss Pip. I miss him, but I am comforted knowing that he went to one of the happiest places on earth, a place where chickens live long, idyllic lives, embraced and safe. Sigh. (Insert "suspension of disbelief, aka denial, here.) And later, when Amelia Amelio started crowing, I was so relieved to know that Betty's best friend would be in a good place, where he could fulfill his highest aspirations. What a comfort. At the feed store I waited for our hens to look over their shoulders, to glance back wistfully and nod. I hoped they would hesitate just a bit before bolting from their cage, to acknowledge that they love me too, that our year together was the best of their lives and that they will never forget our devotion and caring. Maria determined to get one last hug. "Come on chicas! Chick-chick-chick. Come here." "Don't be sad chicas. You'll be alright. I'll miss you." They were too emotional. Later they'll write. It's okay. I understand. 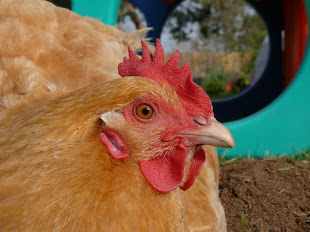 Betty is a single hen. She has our undivided attention and the entire picnic table to chicken-coop conversion to herself. She is happy. There is peace in the gardens of Garage Mahal. She laid her first egg in the nest box and she stayed close by as we worked in the garden. She lets Maria catch and hug her. She comes running for tomato bits and cracked corn. The grass seed I planted has already sprouted and the lawn is looking fuzzy and green. We had to move Joe's bunny hutch around towards the front of the yard, so we will not disturb the new growth. Then I decided Betty's new situation called for a move too. Once again, an area of Garage Mahal intended to be formal and dignified, has succumbed to my practical sensibilities. The fancy little courtyard with the mean and overgrown cycads has been reclaimed for our farm. We brought in Joe, and another barrel. We moved the coop. We planted pumpkin seeds! We set up a wash tub, so I can rinse stuff and collect the water in a pail to re-use in the garden. Alex bought a feijoa, pineapple guava. We love pineapple guava. Things we love... being farmers, reading aloud, and camping. We cannot always get them in the ways you would expect, but we make do. We adjust and improvise. We joked that Betty should not spend her first night in this part of the garden alone. We lit candles and brought out the larger pillows, the thicker sleeping bags. We listened to Max read, then Alex. We listened to the crickets and to the sleepy rumbles coming from the nest box. We dared it to rain, and the very next day it did rain and has rained everyday since! We imagined our pumpkins growing and we told Maria that pineapple guavas have pink petals and that we can eat the soft, plump, sweet petals. Pink is her favorite. A lovely story. Filled with the humanity of denial and the chicanery of chicas. Happy Sunday. BTW, your move on Lexulous. I'm very happy for Miss Betty. The other two girls should thank their lucky stars you found them good homes. Hmph! Aaaahhhh, a happy ending for Betty. I'm glad she has the run of the roost, and I hope she has a long, happy life. I was only half joking about the pot for those other girls! Feijoas, yum! We're coming to the end of the season here, and it is such a short season that one truely has to treasure each and every sniff of their delicious perfume. I didn't know you could eat the petals - is that really true? I've made plain jam and sauce this year and Dad has made Feijoa and ginger jam, which I can't wait to try. So exciting to find someone OUTSIDE NZ that knows of this wonderful fruit! Good for sweet Betty. Now she can have some peace and be happy. There is never a dull moment at your house! Love the camping pictures. I love happy endings too! Happy ending, indeed. There's something about knowing the previous residents of your garden are happy in their new homes, but it doesn't mean you don't miss them. Yeah! I am so glad you were able to relocate those chicas! I just had to have Agatha taken upriver (really) to a good home. We now have Betsy and Buffy and they seem much more relaxed! I am sure YOU and Betty will be more relaxed too! Seem like the best solution for everyone. I am so happy that Betty has such a wonderful and supportive family! She deserves to live at your home. Betty is BEAUTIFUL. :) I adore Buff Orpingtons. I also have a lot of chickens in the village.